Is this really my life....: Lush, the confession! 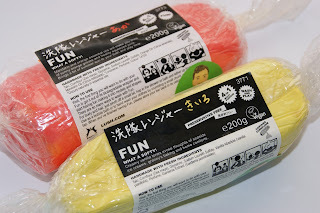 Omg I'm in love with Lush's product called 'FUN' . It comes in various colors and scents Orange, Blue, Pink, Green, Yellow and I recently found out they do a Gold bar. The product has a 4 in 1 usage. It can be used as play dough, shampoo, bubbles and a soap. I have found the Pink smells of vanilla with a slight scent of caramel. Yellow smells like play dough. Green smells of lemon and lime. Orange smells well of oranges. Tj's favourite is the Green each bath time he covers himself in Green 'fun' from head to toe and acts like an alien. Myself I prefer the Yellow 'fun' before my bath I break a small bit off and make a small ball and place triangles around so it looks like the sun. before crumbling it up under the tap to give myself lots of bubbles. Using the product to wash with leaves skin feeling soft and smelling fresh. I give this product 4 out of 5 a product that I will keep on buying for a long time from now.